Can also try moving the height of the cage by shifting it in the stack. Louie my BCL would strike the door any time i walked by when i had it lower on the stack. Once i moved him up higher, he quit. I guess the whole idea of being low and some larger thing walking by scared him. Rango has also struck the cage door a couple times but only on feed day when i am thawing rats. He curled his lower lip but after i gave him dinner, his lip went back to normal. You can cover the door but personally, i would just leave it and like i said, either move them up on the stack or start walking more slowly by the cages until the snake gets used to the movement. Luna also used to strike the cage door and coil up when she was on the bottom of the stack when i moved her from her quarantine tank to one of the AP cages. After about a week, she quit doing it and now is completely oblivious and you can literally stomp past her cage and she just sits there. The snakes need to get used the surroundings. Covering them up will not help as when they get bigger and you uncover them, they will be scared of the open space and being larger, their strikes can hurt themselves. Behira is the second one down from the top (Frank the BTS is the top cage), so she is about 4-5 Feet up in the stack. Secondly, she seems totally chill now with the fabric/drape in front. I took it off today to measure temps and she came and said hi, then went back into her house. No fanfare at all. I get where you are going with this, but she has already bent teeth striking at the acrylic. I have talked to breeders and they are not sure she will "get used to it," and this may be her thing. Some have said she might outgrow it, but no way to know. 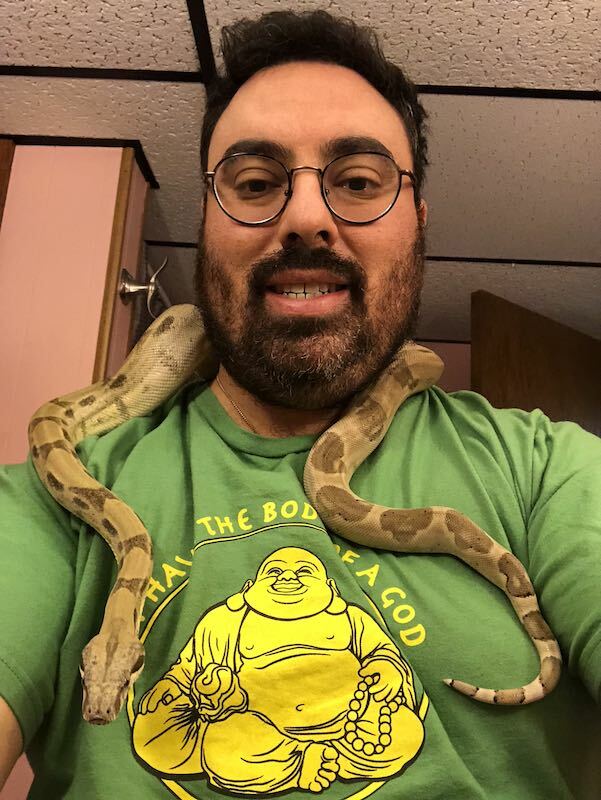 When I spoke to Jeff Ronne, from Boaphile (he made my tanks and is always helpful, but I did not buy Behira from him), he said that some Boa's do it, and he thought the drape was a good solution. How is this significantly different than people who keep Boa's in big racks/Tubs? It seems like those are pretty secure until you open them, and I would be doing the same thing with her, taking the drape off and opening the tank. I am not trying to be argumentative, I am just curious what your thought process/experience is with Boa's who do this and why my setup makes you nervous (for me). I appreciate any feedback, as always. Your set up doesnt make nervous. You might have misunderstood me. I was referring the the boa being nervous. Like i said, my dumerils and BCL both struck at the cage doors when i would walk by quick when i first put them in their cages and had them on the lower cahes in the stack. But after a week and me walking slowly past them, they got used to it and dont do it anymore and the dumerils is pretty oblivious now to any movement unless it involves food. If the drape worked, then grats. 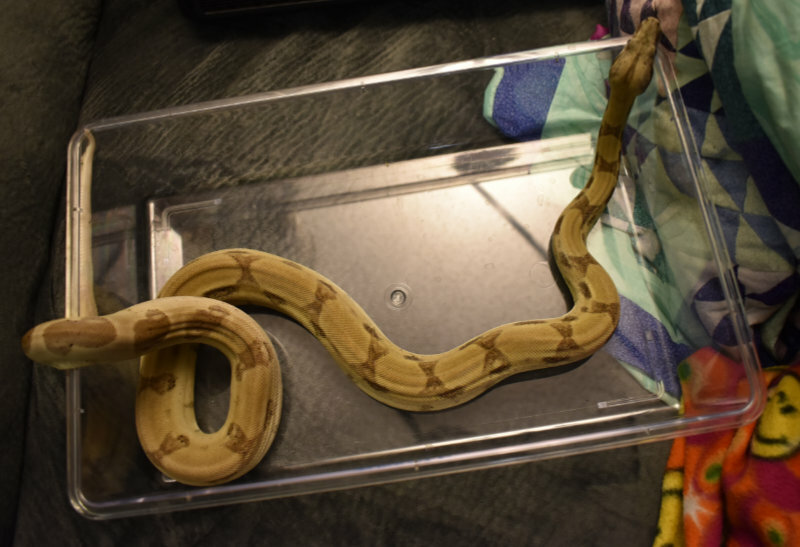 I'm a little different in that i try and get my snakes adjusted to how the cage will be instead of changing it and then going back to the same set up that started the issue after awhile. I believe as long as you give the snakes a place they can feel secure and retire to to be alone, then they will get used to the rest of the set up. That is why i always provide at least one hide for all my snakes regardless if they use it or not. Also I'm assuming you have the snake in a boaphile. Like i said, if the drape method works, great. But to me, having to cover my snakes whenever I'm not doing something inside the cage defeats the purpose of even having the snake lol. 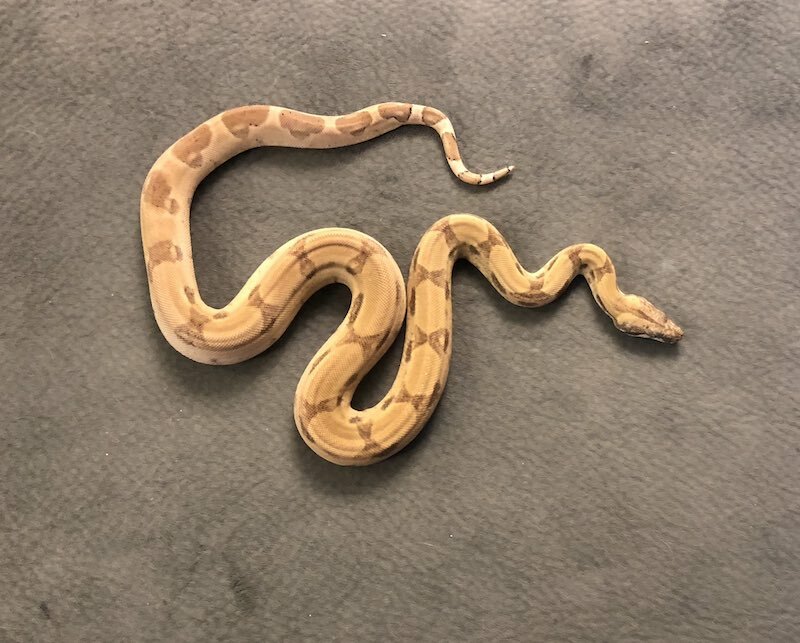 I like to interact and look at my snakes and i usually interact with them daily be it just changing water or just opening the cage to look for a poop or piss and just petting them. They mostly seem to care less but Caesar is my one exception who seems to actually push when he wants attention and once he gets his fill, he will quiet down and lay there. Anyways, like i said, if the drape works, grats. Gotta do what works. 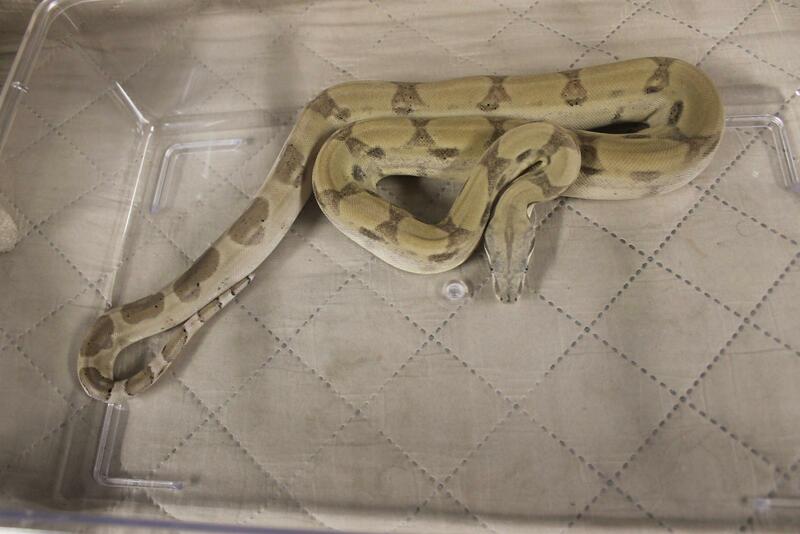 Some boas are just weird haha. Last edited by Sauzo; 03-19-2018 at 12:12 AM. Behira is doing awesome. Since I put the drape up, there has been no striking at the doors and she seems pretty chill. She ate Sunday, so I don't have good weight on her, but she's looking good and fit if I can say so. Terrible lighting and iPhone picture, but she looks very dapper and healthy to me. I felt like sharing. Behira is in Blue and is quite dark as she will shed very soon. I had Katie hold her for a minute while I changed water and upped humidity. Behira is sooooooo incredibly chill, even in blue. Touched her with the hook handle and scooped her up. No issues. We have had Behira 6 months next week. She was about 450G when we got her and was 715G before last feeding (almost 2 weeks ago). I imagine she will drop a nice present with her shed and then I will feed her soon after. I found a picture from my phone from October when we got Behira and tonight and she is noticeably bigger. Also, notice Katie's cool Snake Charm Necklace I got her in the first picture! It’s good to see your mate involved in your passion for snakes. 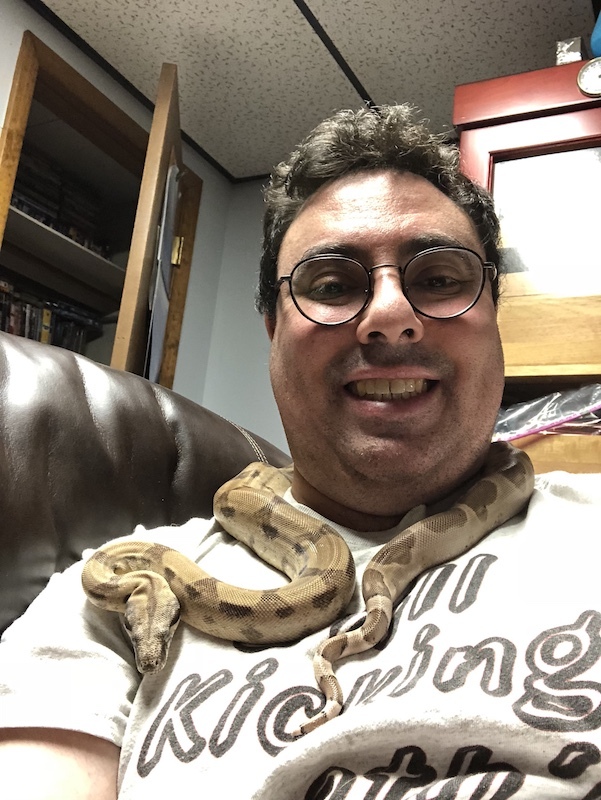 Behira looks like a nice healthy Boa, and a nice bonus having such a fine disposition. Thank you Reinz. 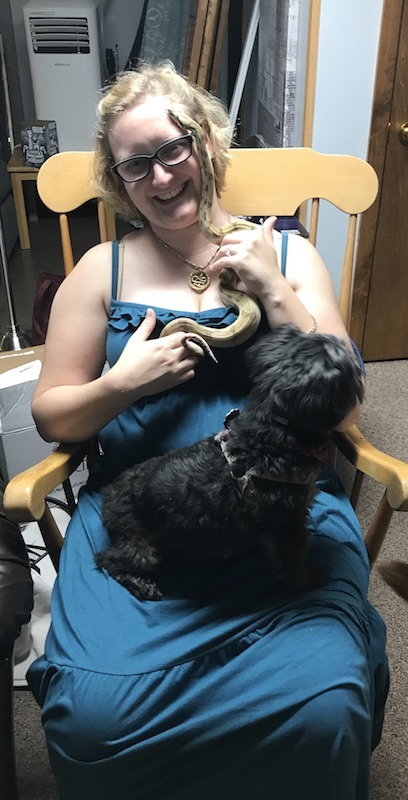 It's awesome that Katie is involved with them, especially since she had no prior reptile experience before meeting me! I still do most of the heavy lifting (cleaning, temp and humidity management, etc), but it's great that she likes them so much. Behira really is the bravest and sweetest snake I have met. No issues as long as she doesn't think I am food! Seriously, love her curiosity and calmness. She's an awesome animal. Can't wait to watch her grow. Looking good! Really nice body structure. I'm glad the drape is helping too. I wouldn't let a boa get anywhere near a dog or vice versa though. 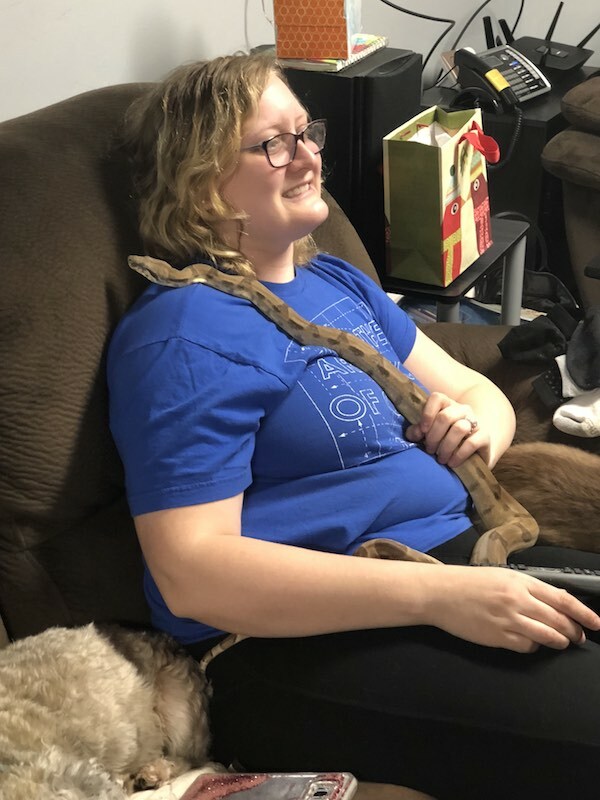 Definitely don't allow a full grown boa near a small dog. Better safe than sorry. She's looking good, and glad to hear her striking habits have cleared up. Behira shed Sunday and nailed and gobbled down a small rat (F/T) Monday. Took her out today for some R&R. She's noticeably bigger than when I got her. Still puppy dog tame and adventurous and curious as ever.